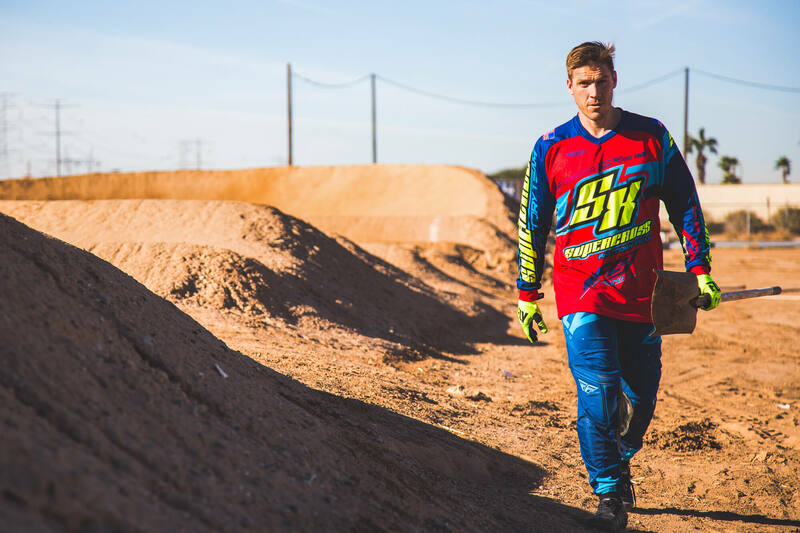 For years in ‘AA Pro’ the worst person you could have behind you coming into a berm was Bubba Harris … now the three-time USA BMX No. 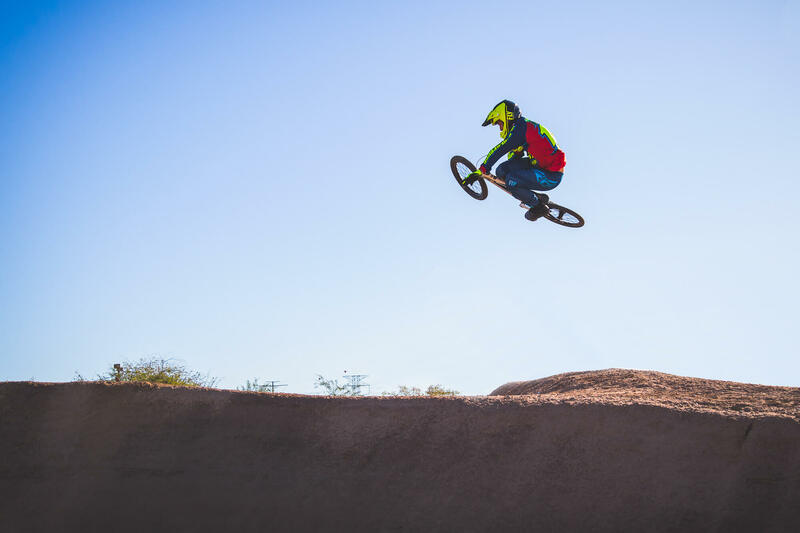 1 Pro and former UCI Elite World Champion is about to unleash that fear on the Vet Pro Class at the USA BMX Winter Nationals in Black Mountain. The guys over at Supercross tell us that the return is all in the name of fun … and while we’re perfectly willing to buy into that, we have to believe that deeply embedded in Bubba’s BMX DNA is an uncontrollable will to win and when the front wheel of his Supercross SX450 rolls up to the gate in Arizona, that instinct will bubble to the surface. We’re hoping it explodes to the surface … the ‘King of the Turns’ is back, and we literally cannot wait! 15: It’s been quite a while since you last raced AA Pro … how long has the urge to re-scratch that racing itch been brewing? 15: We’re pretty sure that we’ve heard you say in the past that there would be no Vet Pro in your future, what changed your mind? Bubba: I was never planning to race vet. I did make that clear multiple times, but I also wasn’t planning on seeing how happy my girls were when they thought they had a chance to watch me race. I can go out there and be fast enough to keep up and throw some elbows without having to change my day to day. 15: Obviously the urge is back now … are there other races penciled in on your calendar or are you taking this ‘one race at a time’? Bubba: Living in Phoenix makes it easy because the season opener is right down the road. I can race this race and put a smile on my girls face and have them home for bedtime. It works out perfect. For now, I’m only planning on the Winters. 15: If the primary goal at the Winter Nationals is FUN … what’s the second? Final? Podium? It’s inconceivable to us that you haven’t pictured yourself on the podium. 15: We see you’ve recently been banging out gates with teammate, Riley House, … is that a regular occurrence or was that Winter Nationals prep? Bubba: After asking my girls if they wanted to see me race time flew by like usual. All of the sudden it was only 4 weeks out. So, I decided to start dusting off the cobwebs. In the last few weeks I’ve ridden the track some and done a few first straights and a couple half laps with the boys. 1 full lap at Goodyear, haha. Haven’t trained at all but I have ridden a little. Doing a full lap at Black Mountain is going to be rough. I ride my mountain bike plenty these days so I am in decent shape but full laps around a BMX track are different. I’m pretty sure I can stay close enough to the guys to make it a race. 15: You’re weapon of choice has been the cro-mo SX 450 recently … you could obviously race on the super high-tech Envy BLK 2 if you so wished, what’s drawing you to the chromoly option? Bubba: When I stopped racing I wanted a bike under me that I could use anywhere and nothing feels better than chromoly. I use this bike at the park, trails, and the track. The 450z is the best feeling bike I have ever been on. If I was super serious about racing I would jump on a carbon, but like I said I’m only riding this bad boy for fun. Bubba: Just planning on racing for the girls this weekend. I’m going to try and stay close enough to Tyler to make it a race, but let’s get real, Tyler is still Elite. I just hope I can make it to the finish line. “I have to say, I was a bit shocked when I got the call. I have been pushing on Bub for a few years to get back on the gate, to jump into Elite and have a few laps, and he always said he was thinking about it, but then it would come down to the time to do it, and he was busy with his family, his church, his clinics, his training, and I knew that as much as I wanted to see Bub back on the track, it would probably never happen. 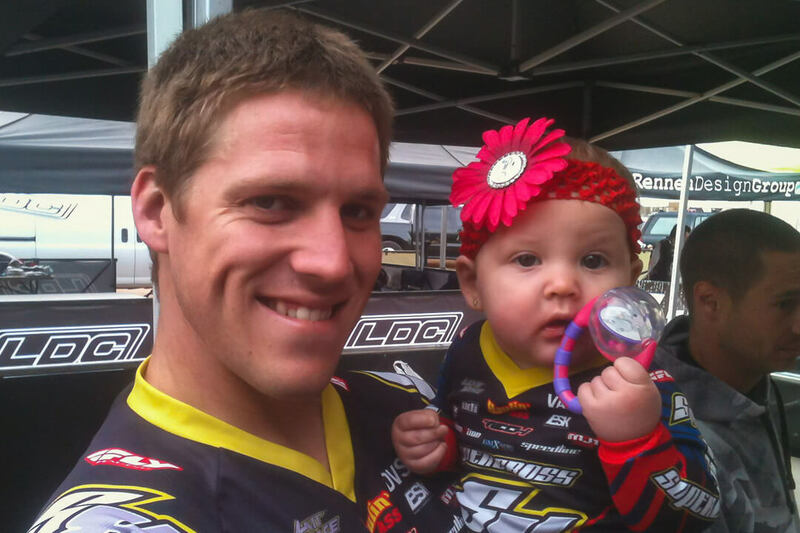 And that was OK, Bub is family and as a BMX fan, I just loved watching him ride, but I know how life goes. So then, I get the call a few months ago and it’s right after the Grands, and its Bub. And the conversation kind of went like this … ‘Hey Bill, congrats on the Golden Crank man! I think you are catching me now, HA, (Bub has a great sense of humor) so I was thinking, I saw the 30-year anniversary logo on the Jerseys and that t-shirt, can you send me a few, I want to rock one. ‘ ‘Sure Bub, no problem man, how’s Kasey and the Kids doing?’ ‘Well Bill that’s why I was calling’ ‘Whoa everything OK bub?’ ‘Yea Yea Yea Bill, they are great! 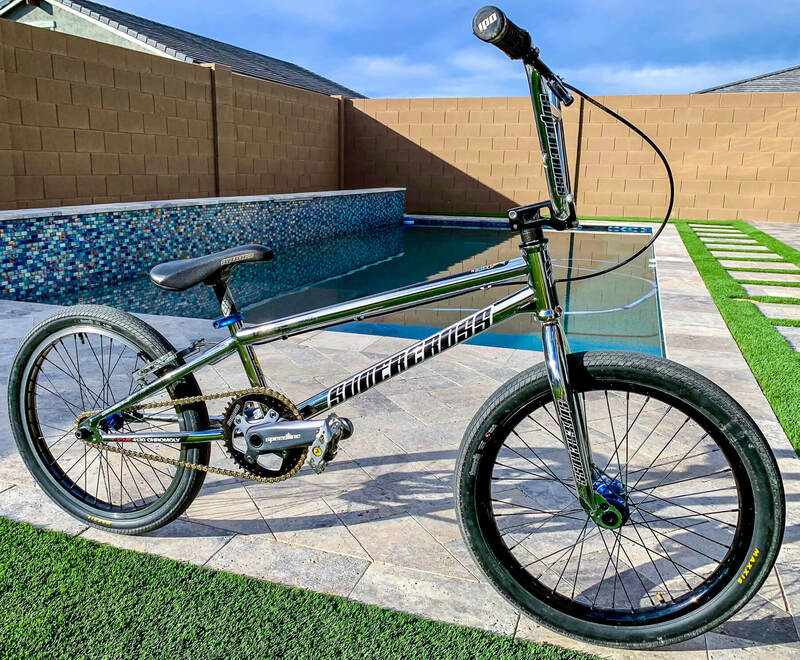 But, I was watching the Grands and Layla asked me if that’s what I used to do, and I got thinking, it’s Supercross 30-year anniversary right, and I love this SX450, man, it’s so fun… So, what do you think if I were to Race Vet this year, you know, for fun… what you think?’. So at this point my grin is ear to ear and I say, ‘Uh, yea Bub, let’s do it.’ And Bub says, ’Yea, it would be cool right, Supercross 30-year anniversary, I can go out and shred a few laps in Vet, Deano can kill some Elite and maybe we can end up with a few more cups and cranks at the end of the year and show everyone how fun it is?’. Now I am on the floor, so I say, ‘Yea Bub, sounds like a plan man, what do you need?’ ‘Uh just a new set of stickers and maybe some bars…. OK Bub, let’s do this’. So, I am thinking, nah, this is just a dream. This won’t happen. And then I start getting random text photos from Bub, he’s on the gate, he’s on the track, nothing public yet, just some private stuff. I have Kevin White (little Josh White from the Teams Dad) call me and go ‘WHOA!! Bub’s out here and man, I have never seen anyone go so fast….’ Then Mark Perkins (little Justin Perkins Dad) calls, ‘Bill I don’t know what’s gotten into Bub, but man, he is flying’. So, I am getting more texts from Bub, just him riding, and finally I see him post on his Instagram. And I knew it, I knew the fire was lit. So, I share the posts on our Instagram and I see all the comments, and Bub’s being quiet, then another post, and a few more pics to my text. So, I ask. ‘Bub, should I sign you up for Winters?’ and no answer, for days, no answer! Finally, I get the text. 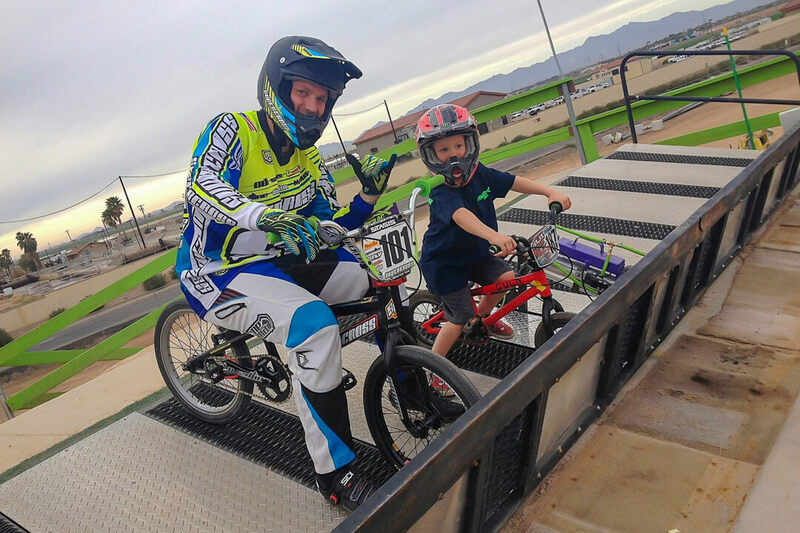 ‘Yea, but were having Fun right, this is for Fun’, I text him back ‘Yes Bub, it’s for Fun, I want to see a huge smile after each lap , that’s all, win, lose, it’s for fun’, then I get ‘OK Bill let’s do this, Jen (Jen is the sign up lady for USA BMX) said I can still run 101’. So, with that, we have Bub signed up for the Winters, for fun, for the fans. No expectations except for some bar banging and some turn swooping and keeping the fans on their toes!!! Can not wait to get enjoy my son racing again even if only for one weekend…. will fill a hole that has been there for many years …. Good luck Bub and kill those turns like years ago …. I agree with Burlin!! Super excited to see Bubba on the track again. This whole story made me smile and warms my heart.